When I was in my twenties and first venturing into the world of cooking, I was fascinated with the idea of writing a cookbook. I dreamed of it, read books about it, and even started writing one. But life, and other busyness got in the way and my dream never materialized. Now years later, starting my little blog somehow feels like a bit of this dream is being lived out. In many ways blogging is even better than writing a cookbook – no editors, now worries about who will publish you or how many books you are selling! Wow – so much freedom! When I was dreaming of writing a cookbook, I always thought I would start with a book on appetizers. When my husband and I entertain, we often make a huge table laden with appetizers and finger foods. Our guests can choose what pleases them and the full spectrum of eating styles and food sensitivities can be catered to. Today’s recipe is for an appetizer that has found its way onto a few of our party tables lately. Our guests have raved about it, so I thought I would bring some over to Angie’s Fiesta Friday! Hopefully, they will rave about it too! If you haven’t knocked on Angie’s blog door at the Novice Gardener, you really must! A whole bunch of us have been getting to know each other and have been sampling what each other brings to the incredibly eclectic table – from photos and stories, to a gorgeous array of recipes! Come join us! We are just having too much fun! This recipe comes from a must-have Canadian cookbook called “Whitewater Cooks with Friends” by Shelley Adams. I love this book and cook from it often. If you are unfamiliar with Balsamic Cream, it is a delicious balsamic reduction sold in all Italian Delis. I have included a photograph below. If you wish, you can make your own reduction. 20 asparagus spears washed and woody ends snapped off. Place asparagus spears in the top of a steamer and steam just until they turn bright green. They will still be firm, but will yield to a fork. Plunge into ice water to stop cooking. Drain the asparagus on paper towels. Cut each piece of prosciutto and cheese in half. Place prosciutto slices on working surface. Lay a slice of cheese on top of each slice of prosciutto. 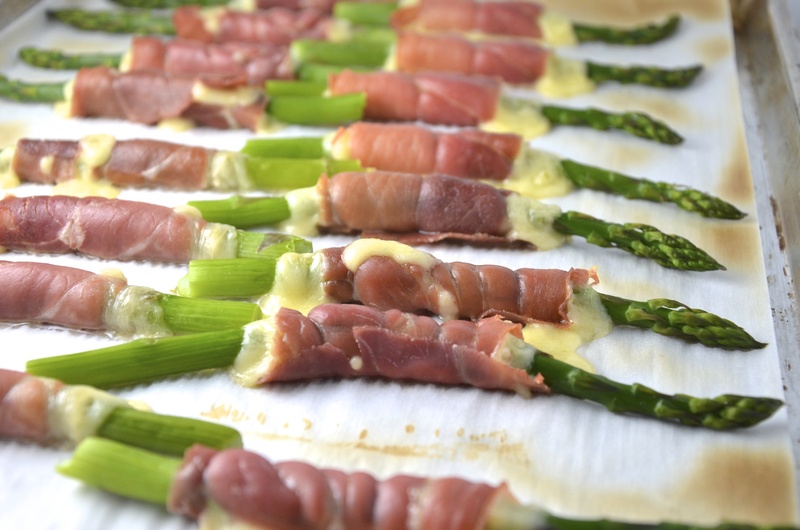 Lay asparagus spears on top of cheese and roll up tightly. If your rolls are springing open, fasten each one with a wooden toothpick. Place each wrapped spear on the lined baking sheet. Place under broiler and broil for 4 -5 minutes until the prosciutto turns golden and the cheese has just melted. Keep your eyes on this – they cook very quickly! Move spears to a serving platter and drizzle with Crema Di Balsamico. Serve immediately. The addition of the balsamic cream sounds wonderful! Wow the flavors in this one… amazing! Julianna, these look scrumptious. Perfect appetizers for a party! 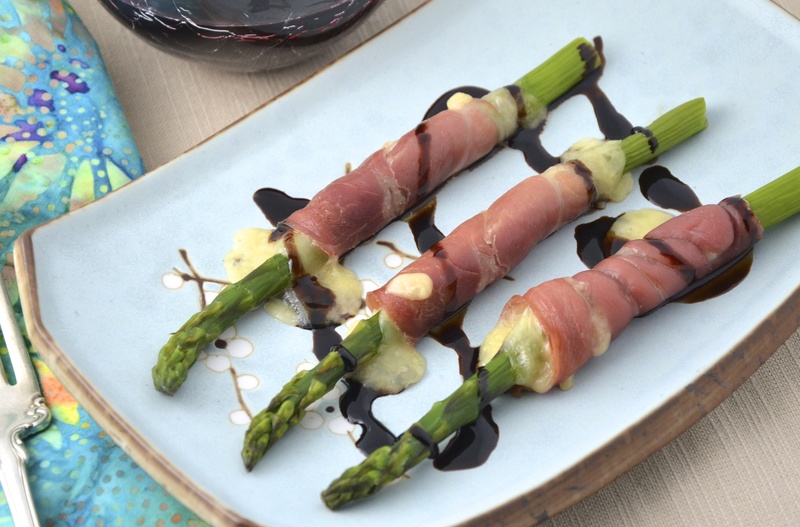 I love the balsamic-prosciutto-asparagus combo! And ooooh, cheese too 🙂 yum! I like the presentation Julianna 🙂 I agree with you about Balsamic Cream, I discover last year this wonderful cream in the market and very happy with taste . Happy Fiesta! Sounds really delicious- green asparagus is one of my favorite vegetables! Yes, we have been eating asparagus almost every day! It is so beautiful right now. Thanks Lisa. I highly recommend the balsamic cream! It is really good on salads too! These sound perfect Julianna! Wonderful combination of ingredients. Impeccable timing too, as the asparagus I’ve been buying lately as been delicious. Looks like these are the perfect appetizer… or perhaps a lunch for me alone, hahhah! Looks yummy! I never used balsamic cream before. Is it the same as balsamic reduced until thickened? This sounds wonderful–asparagus is one of my favorite veggies! Hi Nancy. Thanks, yes I love asparagus too! Even for breakfast!! What a lovely combination of ingredients and a lovely presentation. Julianna, I would love to be a guest at one of your parties! In exchange for a meal by Chef Julianna, I will bring you fresh flowers, delicious wine, and lots of stories. 🙂 I feel quite the same as you about writing a cookbook to store all the recipes I’ve tried and loved. May I suggest printing and binding your favorites every year in a collection? (There are some online services that will do this on the cheap.) I plan to do this as a Christmas present next year for my sister. Just lovely. The balsamic cream sounds so delicious! Thanks Jillian, yes try the balsamic on steamed veggies – so good! So simple and delicious! I love it, Julianna!!!! Thanks so much Serena! Sometime simple is just the best! These are so elegant, Julianna! And that balsamic cream? Oh yes! I imagine it would be great with strawberries! Or as a drizzle for a strawberry spinach salad! Oh yes! Spinach and strawberry salad would be incredible with balsamic cream! Wow! Hey MB! So good to meet someone who has the same kind of dreams I’ve had! I agree! Blogging is this really amazing tool and it really open so many doors! Glad you like the recipe! Thanks for that! I’m so with you! Awesome recipes are the best way to celebrate! Here’s to freedom! Thanks Saucy! I hope your guests like it as much as mine do! Oh wow, these looks amazing!!! What a delicate, smart recipe! And I love the use of balsamic cream! I love to decorate and flavor my food with Balsamic glaze – do you know if it is quite similar? hugs & thanks for sharing! Yum, yum, Julianna! I love appetizers so much I sometimes order a few appetizers instead of a meal. These sound so gourmet and look very elegant. Asparagus season is just around the corner, thankfully. Can’t wait to try these! Ready to co-host FF10? I love asparagus, can you imagine how difficult it is for me to pronounce this word in English (my mother tongue is French but I also can speak in English), lol! In France the season of asparagus just started and I can’t wait to buy some. Many thanks for this delicious recipe,it inspires me. Bonjour Chantal! LOL! Yes, I think it must be a difficult word for French people! 🙂 We are just coming into the asparagus season here too, but our local vegetable store is importing beautiful asparagus from Mexico right now, so I am in heaven! I am so happy that my recipe has inspired you. I hope you also have a wonderful weekend! Loved the plating Chef! I am sure I can substitute the prosciutto with a phyllo sheet and bake with that! Gorgeous presentation and a clean recipe! Thanks Sonal! Yes, phyllo would be really delicious!! I may just try that soon, as I have some phyllo waiting for me in the freezer right now! Hi Justine. Thanks so much for re-blogging my recipe! This is such an honour! I really appreciate it. that looks liek a great food for summer and relatively easy i love asparagus the kids arent sure though hehe, i have never heard of balsamic cream though is that easy to find in the shops? Hi Justine. Yes it is perfect for summer. I totally get that kids may not want the asparagus though…Do you have any Italian markets near your home? I have been able to find it here in Italian Delis or in the supermarket where they sell the Balsamic vinegar. I even found some the other day in a local bakery and discovered that there is white and pink balsamic cream as well. I am looking forward to trying those as well! Good Luck! Great! Let me know how you make out!! You have not only written a delicious cookbook, you are also allowing us all to participate in your very own cookbook show. Beautifully presented as always. Oh Catherine, you are too kind! This sounds so good! I love asparagus dishes! Oh my goodness! They look absolutely mouth watering delicious!